The MACD-23528 is a second generation 12G-SDI, low-power, low-jitter cable driver. It is designed to drive serial digital video data through 75 W coaxial cable typically used in SMPTE and DVB-ASI video applications. The MACD-23528 cable driver is optimized for performance from 19 Mbps up to 11.88 Gbps, The MACD-23528 features the support of 11.88 Gbps signals for Ultra High Definition TV (UHDTV)/4K/8K applications. 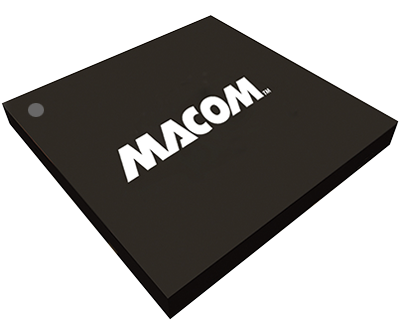 The typical output rise/fall time of the MACD-23528 is 23 ps for 12G, 6G, 3G and HD rates, and 600 ps for SD rates and supports the MADI audio standard. The output signal is compliant with SMPTE ST 2081, ST 2082, 292M, 259M, 344M and 424M. The MACD-23528 also features dual outputs with complement signal outputs which can be individually adjusted for amplitude, slew rate and pre-emphasis through internal register settings. In addition, the device also supports software mode through a four-wire, Serial Peripheral Interface (SPI). The MACD-23528 is packaged in a high performance 3x3 mm LFGA package to simplify PCB design and reduce package parasitics with improvements in Output Return Loss (ORL). No external matching network is needed to meet SMPTE ORL ST 2081 or ST2082 standards. The MACD-23528 is also pin compatible to the M23428, M22428 and M21428 cable drivers. NLE's, MPEG Encoders/Decoders, format converters etc.